The first serious irruptions of the German tribes into the Roman Empire began in the third century with the decay of the central power. We will not entangle the reader here with the vexed and intricate question of the names, identity, and inter-relationships of the various Germanic tribes. Historians find great difficulties in keeping them distinct and these difficulties are enhanced by the fact that they themselves took little care to keep themselves distinct. We find in 236 A.D. a people called the Franks breaking bounds upon the Lower Rhine, and another, the Alamanni, pouring into Alsace. A much more serious push southward was that of the Goths. We have already noted the presence of these people in South Russia, and their division by the Dnieper into Western and Eastern Goths. They had become a maritime people-again upon the Black Sea-probably their traditional migration from Sweden was along the waterways, for it is still possible to row a boat, with only a few quite practicable portages, from the Baltic right across Russia to either the Black or Caspian Sea and they had wrested the command of the eastern seas from the control of Rome. They were presently raiding the shores of Greece. They also crossed the Danube in a great land raid in 247, and defeated and killed the Emperor Decius in what is now Serbia. The province of Dacia vanished from Roman history. In 270 they were defeated at Nish in Serbia by Claudius, and in 276 they were raiding Pontus. It is characteristic of the invertebrate nature of the empire that the legions of Gaul found that the most effective method of dealing with the Franks and the Alamanni at this time was by setting up a separate emperor in Gaul and doing the job by themselves. Then for a while the barbarians were held, and the Emperor Probus in 276 forced the Franks and the Alamanni back over the Rhine. But it is significant of the general atmosphere of insecurity created by these raids that Aurelian (270-275) fortified Rome, which had been an open and secure city for all the earlier years of the empire. In 321 A.D. the Goths were again over the Danube, plundering what is now Serbia and Bulgaria. They were driven back by Constantine the Great, of whom we shall have more to tell in the next chapter. About the end of his reign (337 A.D.) the Vandals, a people closely kindred to the Goths, being pressed by them, obtained permission to cross the Danube into Pannonia, which is now that part of Hungary west of the river. But by the middle of the fourth century the Hunnish people to the east were becoming aggressive again. They had long subjugated the Alani, and now they made the Ostrogoths, the east Goths, tributary. The Visigoths (or west Goths) followed the example of the Vandals, and made arrangements to cross the Danube into Roman territory. There was some dispute upon the terms of this settlement, and the Visigoths, growing fierce, assumed the offensive, and at Adrianople defeated the Emperor Valens, who was killed in this battle. They were then allowed to settle in what is now Bulgaria, and their army became nominally a Roman army, though they retained their own chiefs, the foremost of whom was Alaric. It exhibits the complete «barbarization» of the Roman Empire that had already occurred, that the chief opponent of Alaric the Goth, Stilicho, was a Pannonian Vandal. The legions in Gaul were under the command of a Frank, and the Emperor Theodosius I (emp. 379-395) was a Spaniard chiefly supported by Gothic auxiliaries. The empire was now splitting finally into an eastern (Greek speaking) and a western (Latin-speaking) half. Theodosius the Great was succeeded by his sons Arcadius at Constantinople and Honorius at Ravenna. Alaric made a puppet of the eastern monarch and Stilicho of the western. Huns now first appear within the empire as auxiliary troops enlisted under Stilicho. In this struggle of East and West, the frontier-if we can still speak of a frontier between the unauthorized barbarian without and the barbarian in employment within-gave way. Fresh Vandals, more Goths, Alans, Suevi, marched freely westward, living upon the country. Amidst this confusion occurred a crowning event. Alaric the Goth marched down Italy, and after a short siege captured Rome (410). By 425 or so, the Vandals (whom originally we noted in East Germany) and a portion of the Alani (whom we first mentioned in South-east Russia) had traversed Gaul and the Pyrenees, and had amalgamated and settled in the south of Spain. There were Huns in possession of Pannonia and Goths in Dalmatia. Into Bohemia and Moravia came and settled a Slavic people, the Czechs (451). In Portugal and north of the Vandals in Spain were Visigoths and Suevi. Gaul was divided among Visigoths, Franks, and Burgundians. Britain was being invaded by Low German tribes, the Jutes, Angles and Saxons, before whom the Keltic. British of the south-west were flying across the sea to what is now Brittany in France. The usual date given for this invasion is 449, but it was probably earlier. And as the result of intrigues between two imperial politicians, the Vandals of the south of Spain, under their king Genseric, embarked en masse for North Africa (429), became masters of Carthage (439), secured the mastery of the sea, raided, captured, and pillaged Rome (455), crossed into Sicily, and set up a kingdom in West Sicily, which endured there for a hundred years (up to 534). At the time of its greatest extent (477) this Vandal kingdom included also Corsica, Sardinia, and the Balearic Isles, as well as much of North Africa. 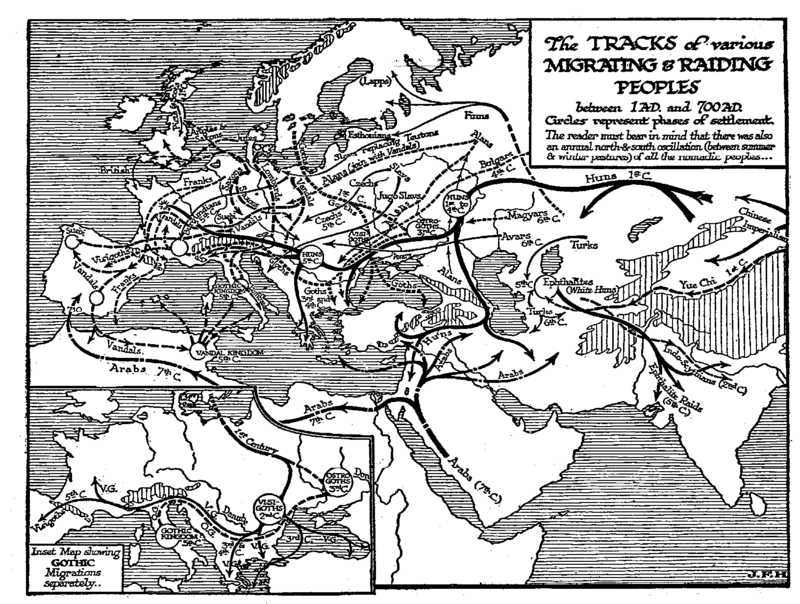 The tracks of various migrating and raiding peoples between 1 AD. and 700 AD. Circles represent phases of settlement. The reader must bear in mind that there was also an annual north-south oscillation (between summer and winter pastures) of all the nomadic peoples. Inset map shows Gothic migrations separately. About this Vandal kingdom facts and figures are given that show very clearly the true nature of these barbarian irruptions. They were not really the conquest and replacement of one people or race by another; what happened was something very different it was a social revolution started and masked by a superficial foreign conquest. The whole Vandal nation, men, women, and children, that came from Spain to Africa, for example, did not number more than eighty thousand souls. We know this because we have particulars of the transport problem. In their struggle for North Africa, Dr. Schurtz tells us,  «there is no trace of any serious resistance offered by the inhabitants; Boniface (the Roman governor of North Africa) had defended Hippo with Gothic mercenaries, while the native population lent no appreciable assistance, and the nomad tribes of the country either Adopted a dubious attitude or availed themselves of the difficulties of the Roman governor to make attacks and engage in predatory expeditions. This demoralization resulted from social conditions, which had perhaps developed more unfavourably in Africa than in other parts of the Roman Empire. The free peasants bad long ago become the serfs of the great landed proprietors, and were little superior in position to the masses of slaves who were everywhere to be found. And the great landowners had become in their turn easy victims of the policy of extortion followed by unscrupulous governors to an increasingly unprecedented extent in proportion as the dignity of the imperial power sank lower. No man who bad anything to lose would now take a place in the senate of the large towns, which bad once been the goal of the ambitious, for the senators were required to make up all deficiencies in the revenue, and such deficiencies were now frequent and considerable … .Bloody insurrections repeatedly broke out, always traceable ultimately to the pressure of taxation … ». Manifestly the Vandals came in as a positive relief to such a system. They exterminated the great landowners, wiped out all debts to Roman Moneylenders, and abolished the last vestiges of military service. The cultivators found themselves better off; the minor officials kept their places; it was not so much a conquest as a liberation from an intolerable deadlock. It was while the Vandals were still in Africa that a great leader, Attila, arose among the Huns. The seat of his government was in the plains east of the Danube. For a time he swayed a considerable empire of Hunnish and Germanic tribes, and his rule stretched from the Rhine into Central Asia. He negotiated on equal terms with the Chinese emperor. He bullied Ravenna and Constantinople for ten years. Honoria, the grand-daughter of Theodosius II, Emperor of the Eastern empire, one of those passionate young ladies who cause so much trouble in the world, having been put under restraint because of a love affair with a court chamberlain, sent her ring to Attila and called upon him to be her husband and deliverer. He was also urged to attack the Eastern Empire by Genseric the Vandal, who was faced by an alliance of the Western and Eastern emperors. He raided southward to the very walls of Constantinople, completely destroying, says Gibbon, seventy cities in his progress, and forcing upon the emperor an onerous peace, which apparently did not involve the liberation of Honoria to her hero. At this distance of time we are unable to guess at the motives for this omission. Attila continued to speak of her as his affianced bride, and to use the relationship as a pretext for aggressions. In the subsequent negotiations a certain Priscus accompanied an embassy to the camp of the Hunnish monarch, and the fragments that still survive of the narrative he wrote give us a glimpse of the camp and way of living of the great conqueror. The embassy was itself a curiously constituted body. Its head was Maximin, an honest diplomatist who went in good faith. Quite unknown to him and, at the time, to Priscus, Vigilius, the interpreter of the expedition, had also a secret mission from the court of Theodosius which was to secure by bribery the assassination of Attila. The little expedition went by way of Nish; it crossed the Danube in canoes, dug out of a single tree, and it was fed by contributions from the villages on the route. Differences in dietary soon attracted the attention of the envoys. Priscus mentions mead in the place of wine, millet for corn, and a drink either distilled or brewed from barley. The journey through Hungary will remind the reader in many of its incidents of the journeys of travellers in Central Africa during the Victorian period. The travellers were politely offered temporary wives. Attila’s capital was rather a vast camp and village than a town. There was only one building of stone, a bath constructed on the Roman model. The mass of the people were in huts and tents; Attila and his leading men lived in timber palaces in great stockaded enclosures with their numerous wives and ministers about them. There was a vast display of loot, but Attila himself affected a nomadic simplicity; he was served in wooden cups and platters, and never touched bread. He worked hard, kept open court before the gate of his palace, and was commonly in the saddle. The primitive custom of both Aryans and Mongols of holding great feasts in hall still held good, and there was much hard drinking. Priscus describes how bards chanted before Attila. They «recited the verses which they had composed, to celebrate his valour and his victories. A profound silence prevailed in the ball, and the attention of the guests was captivated by the vocal harmony, which revived and perpetuated the memory of their own exploits; a martial ardour flashed from the eyes of the warriors, who were impatient for battle; and the tears of the old men expressed their generous despair, that they could no longer partake the danger and glory of the field. This entertainment, which might be considered as a school of military virtue, was succeeded by a farce that debased the dignity of human nature. A Moorish and Scythian buffoon successively excited the mirth of the rude spectators by their deformed figures, ridiculous dress, antic gestures, absurd speeches, and the strange, unintelligible confusion of the Latin, the Gothic, and the Hunnish languages, and the hall resounded with loud and licentious peals of laughter. In the midst of this intemperate riot, Attila alone, without change of countenance, maintained his steadfast and inflexible gravity». Although Attila was aware, through the confession of the proposed assassin, of the secret work of Vigilius, he allowed this embassy to return in safety, with presents of numerous horses and the like to Constantinople. Then he despatched an ambassador to Theodosius II to give that monarch, as people say, a piece of his mind. «Theodosius», said the envoy, «is the son of an illustrious and respectable parent; Attila, likewise, is descended from a noble race; and he has supported, by his actions the dignity which he inherited from his father Munzuk. But Theodosius has forfeited his parental honours, and by consenting to pay tribute, has degraded himself to the condition of a slave. It is therefore just that he should reverence the man whom fortune and merit have placed above him; instead of attempting, like a wicked slave, clandestinely to conspire against his master». This straightforward bullying was met by abject submission. The emperor sued for pardon, and paid a great ransom. Hereafter the Huns, go far as that name goes in Europe, the Huns of Attila, disappeared out of history. They dissolve into the surrounding populations. They were probably already much mixed, and rather Aryan than Mongolian. They did not become, as one might suppose, the inhabitants of Hungary, though they have probably left many descendants there. About a hundred years after came another Hunnish or mixed people, the Avars, out of the east into Hungary, but these were driven out eastward again by Charlemagne in 791-5. The Magyars, the modern Hungarians, came westward later. They were a Turko-Finnish people. The Magyar is a language belonging to the Finno-Ugrian division of the Ural-Altaic tongues. The Magyars were on the Volga about 550. They settled in Hungary about 900… . But we are getting too far on in our story, and we must return to Rome. In 493 Theodoric, a Goth, became King of Rome, but already for seventeen years there had been no Roman emperor. So it was in utter social decay and collapse that the great slaveholding «world-ascendancy» of the God-Caesars and the rich men of Rome came to an end. In Helmolt’s History of the World .